"Top quality cards. Easy to make and quick to arrive. What's not to like?	" Design your own notebook paper and journal notebooks for school that your kids will be working on and cherish throughout the year. High quality wire-bound A5 size personalized paper notebooks feature your designs printed on sturdy front and back cover, inside front and back cover, high quality paper stock and a durable black spiral binding. One of the great things about our photo writing notebook is that it can be fully customized to fit your style. There are many options available for our personalized notebooks, you may choose between lined paper, or plain paper, number of pages you create, customize the cover, inside cover, inside back and back with your images and personal message. We offer a variety of photo layout and fun background template to get you started. 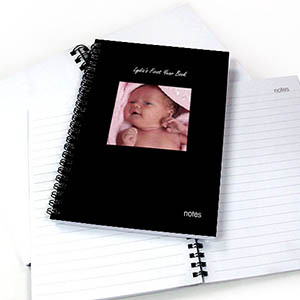 Cheap personalized notebook work great as special wedding gifts, graduation gifts, family reunion keepsake, notebook gifts for kids and practical school gifts.